Everybody has one. When people hear that I average 60 miles a week (which I’m sure is on the low end of the KCTC Ambassadors!! ), they always ask how I got into running. This is my story. I had lived in Wichita for a few months and didn’t know many people. This was definitely my own fault- I woke up, went to work, came home, went to bed. On the weekends that I did not have to work (I was working retail at the time), I would go home to Manhattan. I would occasionally go see my boyfriend at the time in Topeka. My life was repetitive, dull, and uneventful. I clearly needed a hobby. My mom has always been a runner and suggested that I try it. In college, I would run 2-3 miles tops, and hated every second of it. To me, running was just a means to stay in shape and was always used as a form of punishment when I was a cheerleader at Colorado State University. It was never enjoyable. So I began running every day after work, starting with just 2 miles. After running every day for about 3 weeks, I really started to enjoy it and upped my mileage. After a month and a half, I was running 8 miles a day. On a trip up to Manhattan, I logged 14 miles! It was that day that my Mom signed me up for a marathon- 2 months later. I will tell you that looking back it is not wise to train this fast for a marathon, but if you ever have the pleasure of meeting my Mom, you will understand- she is the biggest go-getter I have ever met in my life. Over the next 2 months, running became something different to me- rather than something to fill the boredom, it became a passion. It was a means to let out the stress and loneliness I had thus far experienced in Wichita. When things ended for good between the boyfriend and I, running truly healed me. I joined a gym to cross train in an attempt to prevent injury, and ended up meeting my closest friends. 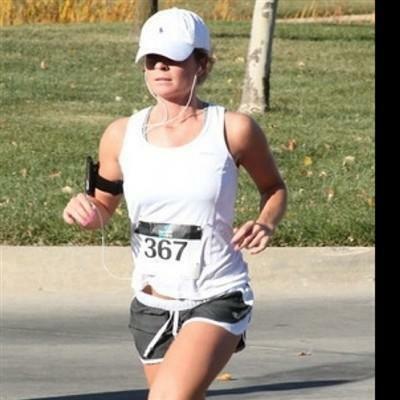 I ran my first marathon in May of 2009, after just 2 months of serious training. I logged a time of 3:52, which beat my goal of under 4 hours. The feeling of crossing that 26.2 mile finish line was pure bliss. I have never been more proud of an accomplishment in my life. Running really changed my life, and the direction it has now taken me. I don’t log more than 10 miles a day unless I am training for a race, so running has become more relaxed and easy for me. I will be a lifelong runner from here on out, because running is a sport that gives back what you put into it- and I am so grateful for how much it has given to me. Erin Butler is one of the ambassadors for the track club, her passion for running is deep and she loves inspiring and helping others!